This week, over at Lollipop Crafts, the challenge is Anything Goes! I just got my Unity stamp order a few days ago and couldn't wait to use it. One of the items I ordered was the kit of the month from May of this year. It's the Love In An Instant set. OMG! I just love so many of the stamps in this set and was so excited when it went on sale recently. I just had to get it at that great price! The first stamp from this set to get inked up was the Polaroid stamp. It comes with two pretty little hearts in the corner. The set includes the sentiment "I Miss Your Face" which I think is just too cute! I stamped it on the Polaroid and then turned to my stamp collection to find a suitable image. 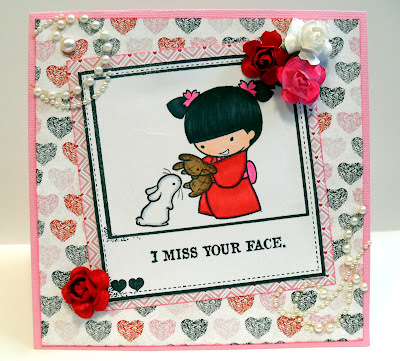 I came upon Akemi from my Sister Stamps LLC collection. I thought this image would work well with the sentiment, so I inked her up and colored her with Copics. I have to say that I'm not too happy with the coloring. *sad face* I'm a little out of practice and need to get back into studying coloring techniques. Yikes! I used paper from Echo Park's Yours Truly line and added roses and pearl flourishes. I also inked the edges of the paper with pink ink. Thanks for stopping by. Hope you all have a Happy Monday! Absolutely BEAUTIFUL Dena! I love this cute image. Awww, such a sweet and adorable card.